Hobby: Playing "Match the Eyes" and "Find the Odd Eye Out" with her friends. 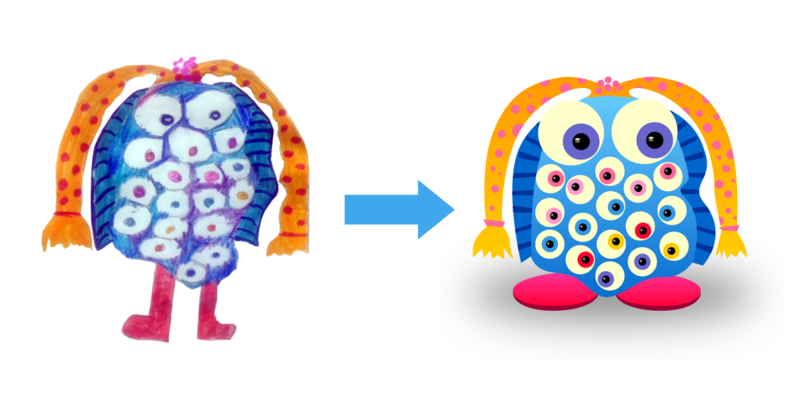 Interesting fact: She gets a new eye every birthday (she has 18 eyes now because she's 18). Hobby: Going right through people and scaring them! Interesting fact: When he's angry he makes a bonfire, when he's sad he creates a flood and when he's cheeky he likes to swallow buildings and shoot them out of his tummy!?!?!? 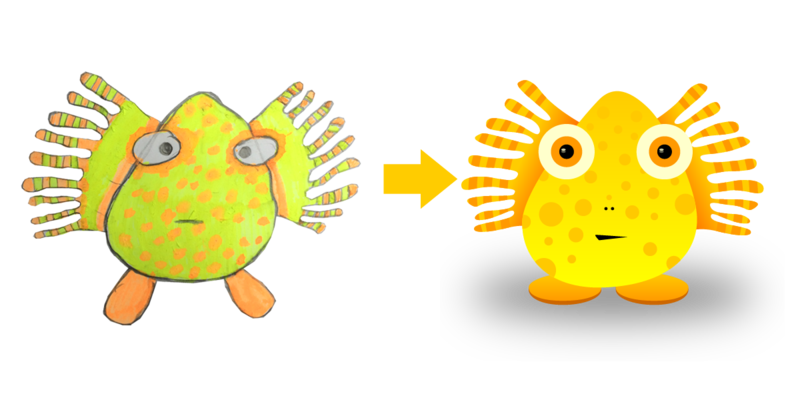 Tilda's wonderfully colourful Squeeble looks like it was inspired by a tropical fish and from the description she gave, Fizz definitely loves the ocean. 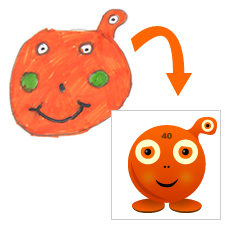 Tilda has used fluorescent pens to give Fizz a really bright look that immediately stands out. Well done! Hobby: Sailing to be close to her fishy friends. Interesting fact: Fizz can live underwater and in air. She loves to visit her friends under water. 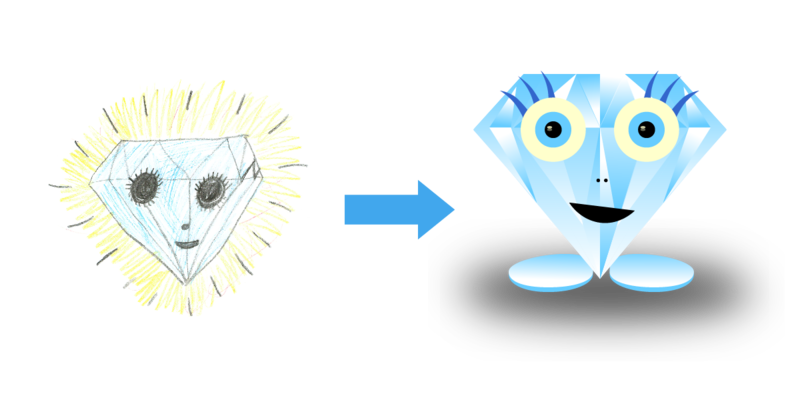 Everyone needs a bit of sparkle in their life and this diamond-shaped Squeeble by Imogen will give the rest of the Squeebles exactly that. Hobby: Flying up into the sky and looking back down at the world. Interesting fact: If you tap her nose she glows. 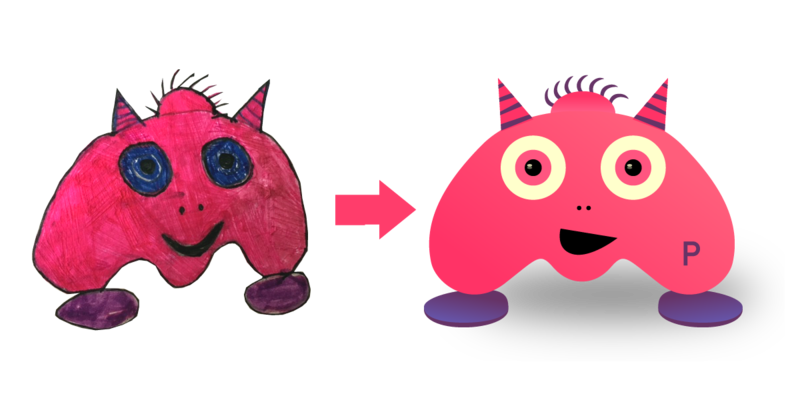 Things we loved about Gobbles... he's bright pink. He looks like he's wearing two party hats. He has curly spikes on his head. And his hobby is "carrying vegetables", which is one of our favourite things to do too!!! Well done Tessa - your drawing is awesome! Interesting fact: He eats everything in sight! 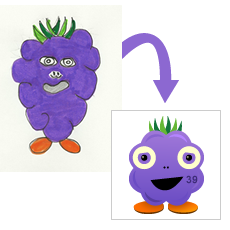 While he can't enter any of our competitions, our son is constantly designing Squeebles. This is just one of them. Favourite Foods: Pizza and carrots Interesting Fact: His family have passed the name Flame down from father to son. Personality: Flame is very kind and excitable. He likes doing magic and is very pleased when he gets a trick right, which is not very often. 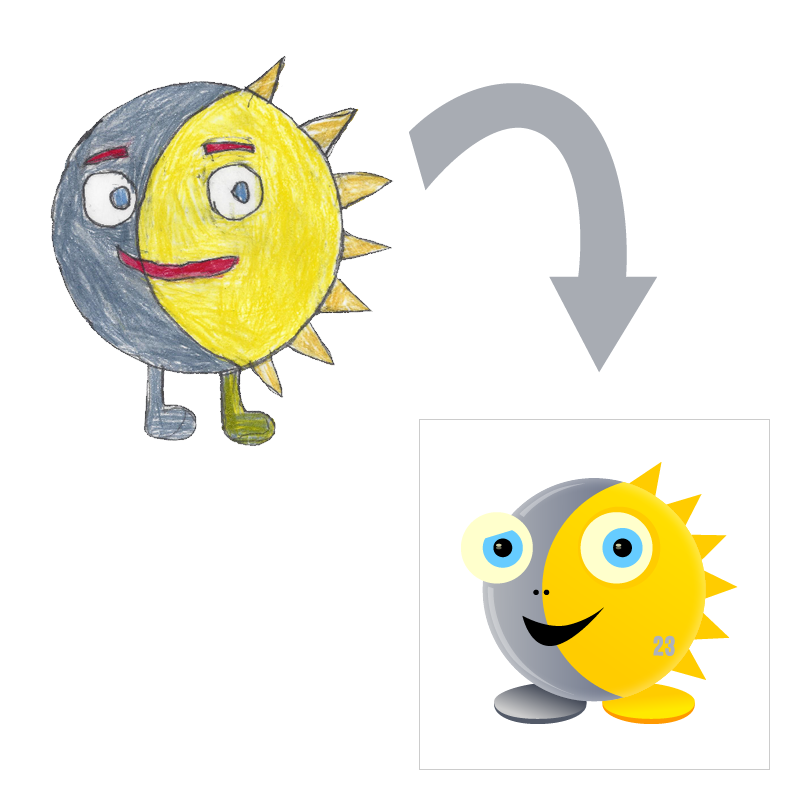 Other Information: Eclipse likes to stay up late at night but he also likes to get up in the mornings to look at the sun. Then he goes and plays. 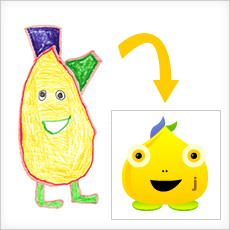 What We Liked: A simply brilliant drawing with a fantastic Squeeble personality to go with it. And all from a 5 year old! Well done Ignatius! Other Information: He always gets bulls eyes in archery. What We Liked: The colours are fantastic in Ira's Squeeble and we loved Bolin's fiery hair! Other Information: Dat once danced on a mountain for 7 hours!!! What We Liked: Alice's creativity, use of colour and quirky ideas captured our imaginations and we couldn't resist bringing Dat to life. Other Information: He never gets seen! What We Liked: We loved the colours Robert chose and also the fact that his Squeeble "never gets seen"!!! Other Information: Bumps likes the sand and the sea so it is very hard to spot him! 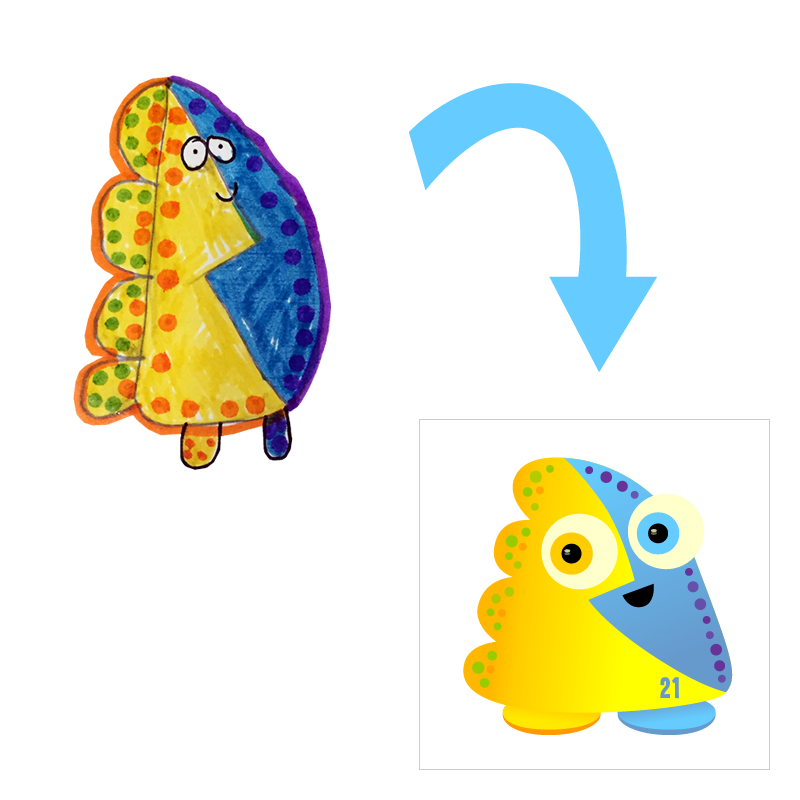 What We Liked: Another hard-to-spot Squeeble, we liked Bumps' seaside theme and thought Lucy's drawing style was beautiful. Other Information: If you point a torch at Wobble the light goes straight through him! Other Information: Cloud is very calm. He grows a beard for one month of the year, just for fun! 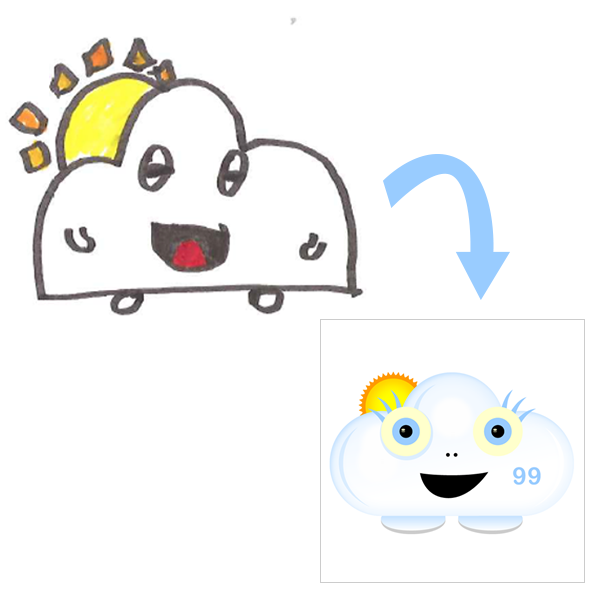 What We Liked: We loved that Amelia's cloud-shaped Squeeble permanently has the sun resting on his shoulder - it feels like a really joyful thing. We're hoping that it's not a 'beard of rain' that he grows once a year! Special Mention: This Squeeble was selected from a beautiful collection of Squeebles designed especially for us by the children at St Margaret's Lee Primary School. Other Information: Angel is kind, gentle and full of joy! She is famous for her smile and cheers everybody up. What We Liked: We really loved Angel's beautifully designed wings. She seems such an ethereal character that we imagine she may even manage to eat spaghetti gracefully! Hobbies: Rialy is really fast and hums whilst she's running because it makes her go quicker! What We Liked: Some of the best designs are often incredibly simple and this is what we loved about Freya's Squeeble - bright colours and a clean shape full of impact. We also LOVED the idea that humming would make Rialy go faster! Hobbies: Falling to the ground, playing on the computer (he especially loves iPads) and learning karate! Other Information: Raino is colourful and full of fun. He is also very fast - he once ran around the world in 2 minutes!!! 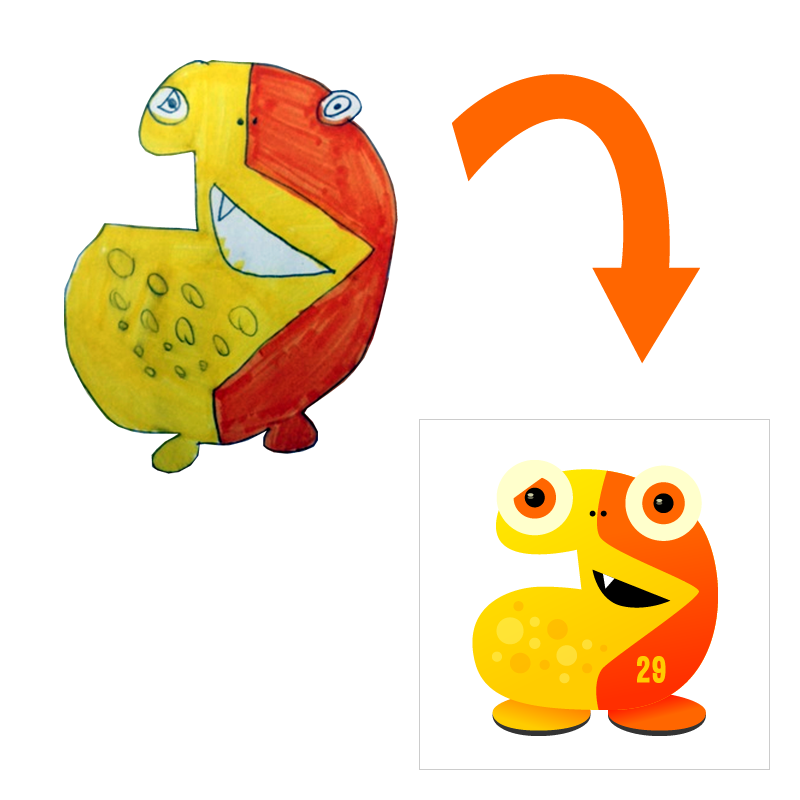 What We Liked: Raino fits in really well with the other Squeebles. He's colourful, characterful and happy! Well done Joshua. What Nicole Says About Ti: He is a good boy. He doesn't like flying kites, he just is nice. And I like him. 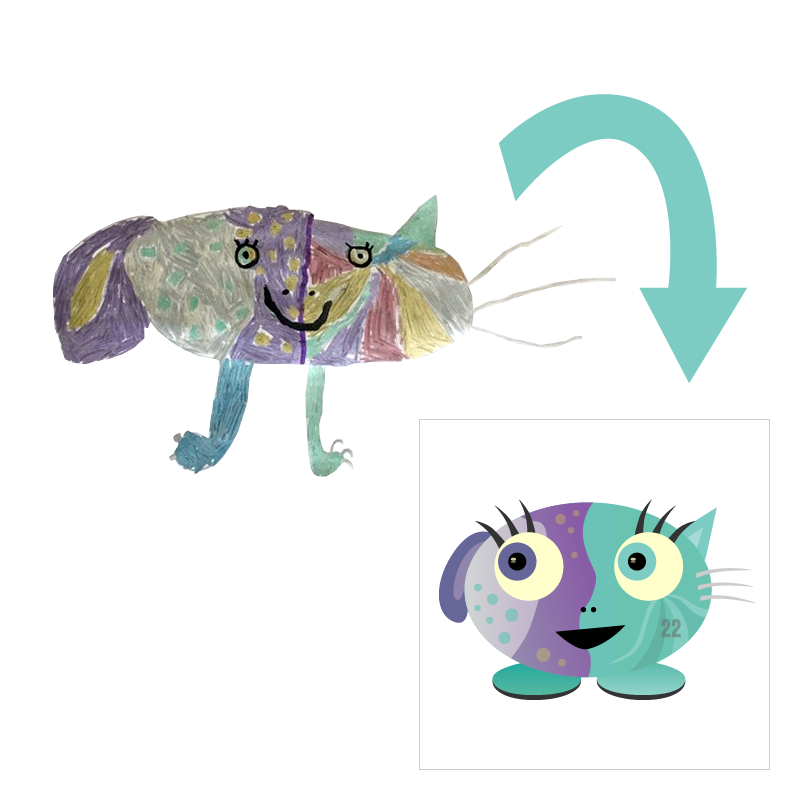 What We Liked: Ti sounds like such a nice Squeeble who just wants to have fun. We like that! 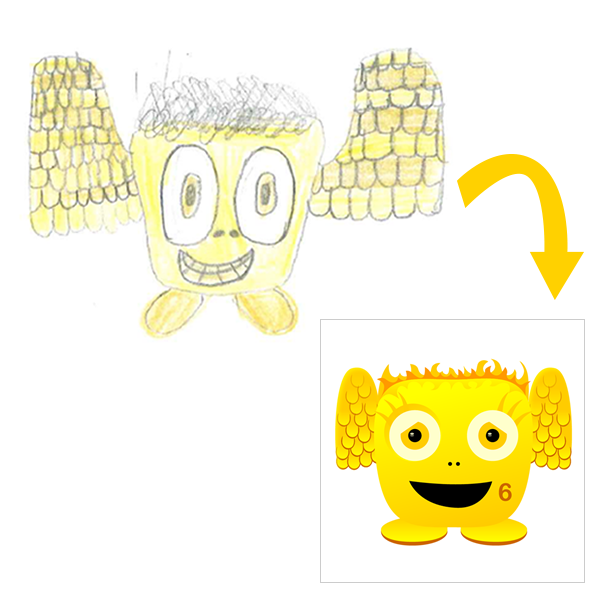 Nicole's drawing is brilliant - we love the colours she's picked for Ti - they're so nice and bright. Hobbies: Sports - running, jogging, sprinting and doing all of these on the spot! Other Information: Bebe is kind and helpful. She's a star. She's great. Her nickname is The Spiky Rhino! 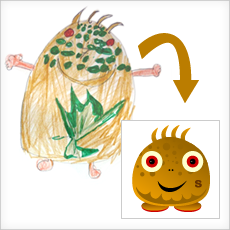 What We Liked: The colours in Poppy's drawing are beautiful and we loved how much detail she put into Bebe. Being called The Spiky Rhino was a really fun addition too. Hobbies: Gardening, hide and seek and making new friends. Interesting Fact: He loves playing hide and seek and his favourite hiding place is in the trees where he can blend into the leaves. What We Liked: The shading on Joel's drawing is wonderful. We really liked the colours he picked. 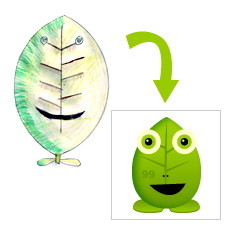 There are no Squeebles who look like leaves so Leefee is a really original idea. Well done Joel! Hobbies: Climbing in trees and bushes. Other Information: He sleeps hanging upside down in a tree holding on by his toes. 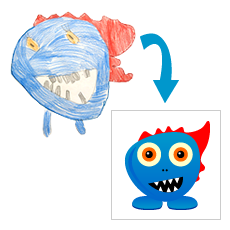 What We Liked: Ferne's drawing is wonderful and Bramble's personality sounds really fun. We loved that he sleeps hanging upside down and thought that rosehip sauce sounded very unusual. Well done Ferne!!! Favourite Ice Cream: Peach and strawberry with strawberry sauce underneath. Hobbies: Trampolining with its friends. 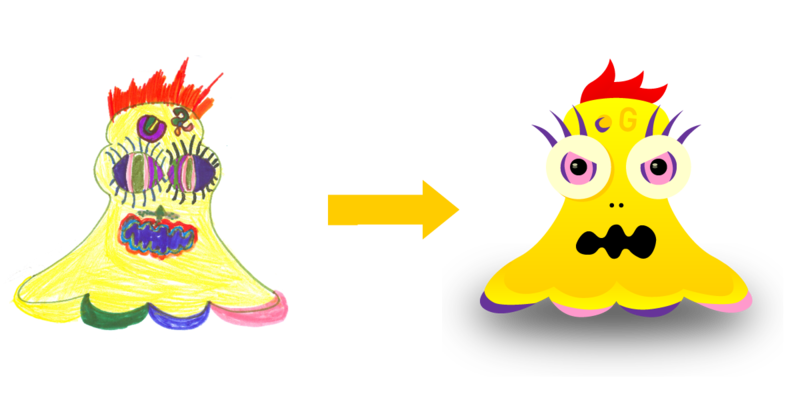 Other Information: We don't know anything else about Blob - even if it's a girl or boy Squeeble... very mysterious! We shall try to find out more soon. 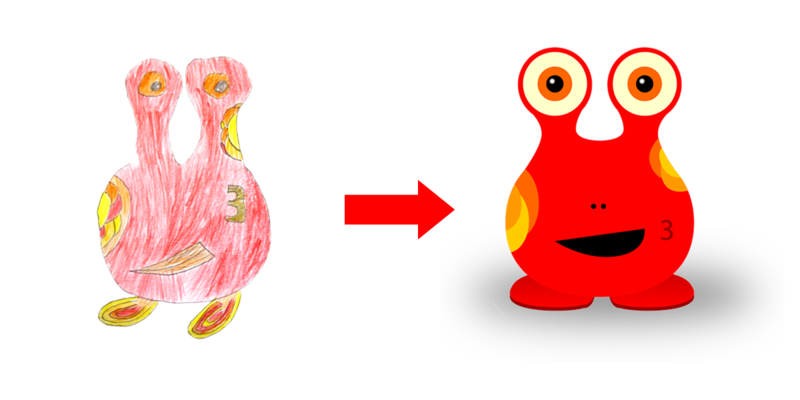 What We Liked: Blob has 3 eyes, which is pretty unusual for a Squeeble (only two other Squeebles have 3 eyes). 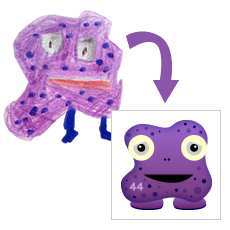 Our younger judges really loved Blob and thought it was a very cute Squeeble. Hobbies: Scaring people by making his volcano erupt. Interesting Fact: Kaboom once scared the whole town by making a big bang at night. 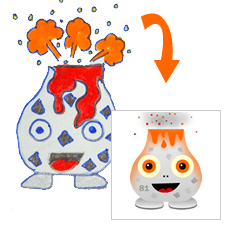 What We Liked: Kaboom is a completely unique Squeeble - we loved that despite being scared of loud noises he still likes making loud bangs from his volcano!!! Louis also sent us a picture of Kaboom's volcano home, which was brilliant. 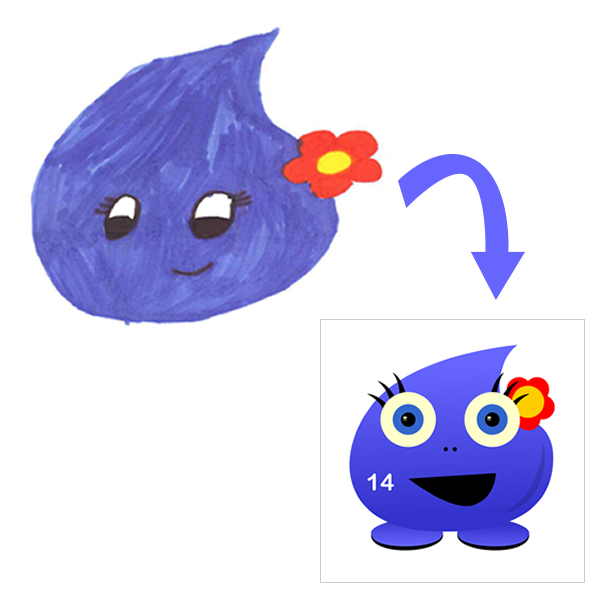 Other Information: Mud loves to go outside to play with his friends. He lives in a swamp which is very dark. He is best mates with Whizz. His name is mud, but his friends call him SuperMud. 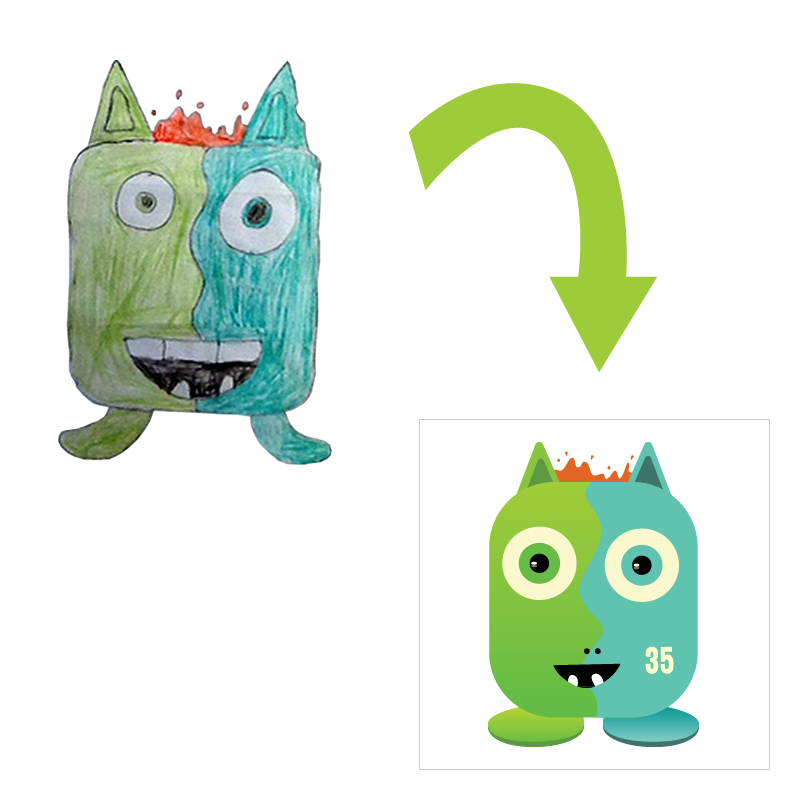 What We Liked: Seth's drawing looks great - we particularly liked the spikes on Mud's head and his big smile. We thought him being called SuperMud was very cool too! Interesting Fact: Frilly is jokey and funny. She loves numbers - her favourite number is 64. She once set a world record for the longest time skipping! 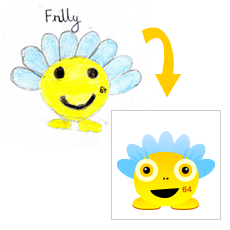 What We Liked: Frilly is colourful and bright - we really liked how she loves numbers and has a favourite number. 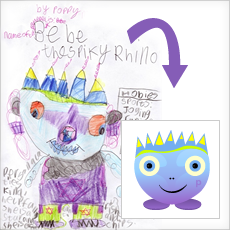 Jemima's drawing uses brilliant colours and Frilly makes for a really interesting looking Squeeble. Favourite Ice Cream: Mint ice cream with freshly picked blueberries, topped with strawberry sauce!!! Hobbies: Looking after rare and exotic plants. 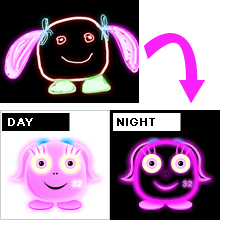 Other Information: Her job is to illuminate dark places in the night so the other Squeebles can get home safely. During the day, she bounces on her trampoline in the garden, to charge up her glow. Lumina is known to be the biggest chatter box ever, but all the Squeebles love her because she is very kind. What We Liked: She glows in the dark!!!!! How cool is that?!?!? And, she's smiley and kind, which is how everyone should be.